For individual investors, 2017 was a dream. However, 2018 has been a different story. After a record setting start to the year, the tides turned quickly on the unprecedented market run. During a short 13 day window from late January and early February the Dow and S&P 500 tumbled into official correction territory, marking the first correction investors had witnessed in two years. The result? More investor fear (as measured by the CBOE Volatility Index) in almost a decade. 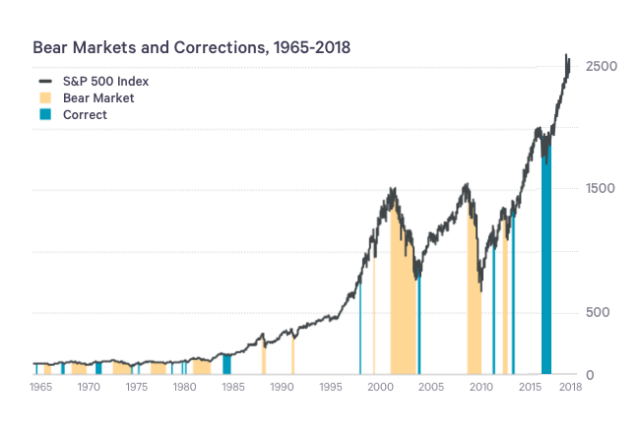 Just as we have seen during previous market corrections, many individual investors sell when the market declines out of fear it will never come back. However, the opposite is actually true. Not only will the market come back, but it will do so a lot sooner than you might think. While some experts are predicting there are more corrections ahead, the reality is we can’t predict the future. But we can certainly use the past to help inform how we think about market corrections. So in this post we’ll present data on how market corrections work so you can come in off the sidelines and keep investing in your future. Because the market was on a tear, investors have been sensitive to any downward trends. 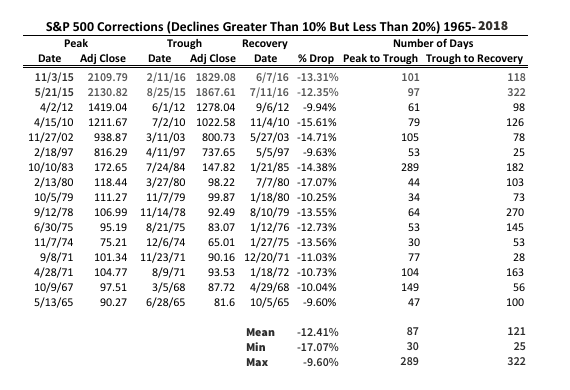 So when the latest stock market correction — defined as a peak-to-trough decline of at least 10% — occurred on February 8, 2018, it sent shockwaves. The result has been fear and uncertainty, and many investors pulling the money out of the market or keeping their money in savings while they wait it out. But just how long should this last? As you can see the mean time to recovery was only 121 days, which isn’t that long of a time to exercise patience when you’re investing for the long-term. Interestingly, it took on average around the same amount of time to recover as it did to decline. Yet numerous research organizations, most notably DALBAR, have found that individual investors consistently run for the exits whenever the market drops, which on average costs them 4% per year. Unfortunately bear markets take much longer to recover. But the good news is they do recover — you just have to have more patience versus corrections, which historically have taken about the same amount of time to recover as they did to create their maximum losses. The mean time to recovery for bear markets is 684 days, which is also twice as long as it took to reach a trough. 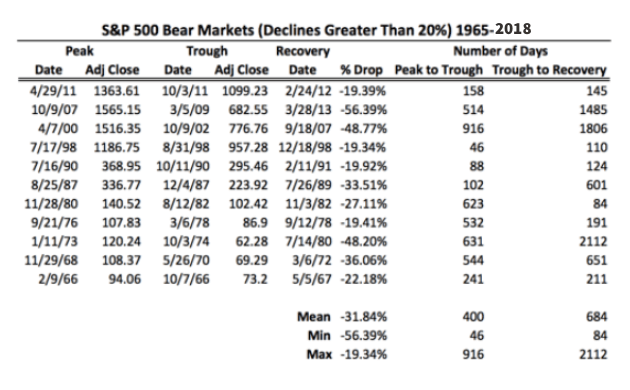 But keep in mind the average was highly influenced by the six years it took to recover from the bear market in the 1970s. Even the financial system meltdown in 2008 required less time to recover. If you plan on saving over the long-term even a bear market shouldn’t stop you from consistently adding to your investment account. In fact, investing in a bear market can actually increase the value of your holdings at retirement because, in effect, you get to buy at a discount all along the way. To put it another way, if an investor started investing on January 1, 1965 and endured all of the corrections and bear markets over the next 50+ years they would have seen a compounded return of 6.7%, far in excess of the compounded inflation rate of 3.6%. But human nature is tough to overcome, so while ignoring market corrections and bear markets and staying the course is the right thing to do, it doesn’t necessarily feel that way when markets are volatile. So our advice: use data to guide your decisions, and remember: slow and steady wins the race. Wealthfront prepared this post for educational purposes and not as an offer, recommendation, or solicitation to buy or sell any security. Wealthfront and its affiliates may rely on information from various sources we believe to be reliable (including clients and other third parties), but cannot guarantee its accuracy or completeness. See our Full Disclosure for more important information. The S&P 500® is an index of 500 stocks seen as a leading indicator of U.S. equities and a reflection of the performance of the large cap universe, made up of companies selected by economists. The S&P 500 is a market value weighted index and one of the common benchmarks for the U.S. stock market. The S&P 500 is a product of S&P Dow Jones Indices LLC and/or its affiliates and has been licensed for use by Wealthfront. Copyright © 2015 by S&P Dow Jones Indices LLC, a subsidiary of the McGraw-Hill Companies, Inc., and/or its affiliates. All rights reserved. Trading Forex – How Good are Professional Traders? Fly Fishing in Cincinnati – Come and Join the Fun! OptionRobot Unbiased Review | Is This Software Legit or Not?